We’d like to welcome Tristen Thomas Zauche to the world! Tim’s wife Kersten brought Tristen in today for a visit, and naturally, he was the star of the show. 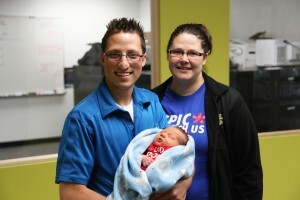 Mom, Dad, and baby are all doing great, and we wish them well for this new chapter of their lives! 0 comment(s) so far on Nice to Meet You, Tristen Thomas Zauche!